A mere 3 hours away from Chiang Mai is the small town of Chiang Rai. While there isn’t anything much special to see within the town (except perhaps the clock tower and night market), the surrounding countryside contains some pretty spectacular locations. There are dozens of companies selling day tours to Chiang Rai from Chiang Mai for somewhere around 1000 baht ($30). I don’t recommend these. They pick you up around 7-8 AM and you spend six hours just driving to and from Chiang Rai. You lose too much time that way, and end up rushing through or skipping the attractions. Instead, I recommend taking the Green Bus for 129 baht ($4) the night before you want to explore. Find a good hostel or hotel, like Chiang Rai Central Guesthouse. Then you can get up early to either rent a motorcycle or get a full tour. Personally I went for the tour. It was a little pricey (1000 baht, or $30), but it was a great choice for several reasons. First, the guide gave information that I would not have received on my own. Second, it was raining throughout the day. Third, although Songkran was over, people were still throwing buckets of water at the van, as if the rain wasn’t enough. Fourth, I’m currently writing an article on the 10 reasons why you shouldn’t rent motorcycles in Thailand. Here are the 10 places the tour took me to, plus a bonus which wasn’t on the tour. If you do plan to do your own motorcycle tour of Chiang Rai, this post will be invaluable, giving you the information you would otherwise lack without a tour guide. Scroll to the bottom to see all attractions on a map. This is quite possibly the most interesting temple I’ve been to in Thailand (or anywhere for that matter), and I didn’t even get to see the interior. The walkway to get inside is smooth marble, and they close it when it rains lest someone falls off. But the outside is spectacular in its own right. In 1997, Mr. Chalermchai Kositpipat started construction on the temple to put Chiang Rai on the map as a tourist destination for real. He certainly accomplished that. Incidentally, I happened to see the artist himself while I was there! But then I found out later he lives there above his own art gallery. Wat Rong Khun, as it is correctly called, was painted white to give it a more pure, religious feel. The motif is the struggle between good and evil, and depicts it in the most creative of ways. At the ticket booth, before you even get to the temple, there are two hideous statues of death, one connected to alcohol and the other with smoking. Good thing I do neither! The temple entrance is surrounded with sculptures seemly pulled from Dante’s Inferno. Along the path, skeletal hands wait to pull you down if you fall off or lose your way. Inside the temple, the art is filled with some of the more nefarious individuals in history who have contributed to wars and strife across the planet. These include Hitler, Saddam Hussein and George Bush. There’s also a large picture of the Twin Towers in flames. But there are also characters like Kung-Fu Panda, Michael Jackson, Elvis and Superman. These are all on the far wall from the Buddha statue. The concept is that many things, including hedonism, are not part of the path to Nirvana. Do you agree? Other attractions of the temple complex include the “most beautiful bathroom in the world” or “golden toilet,” gorgeous landscaping and an art gallery with all of Mr. Kositpipat’s work. Unfortunately there is no photography in the temple or gallery, so you’ll just have to visit for yourself. Read my story on how to avoid the huge crowds at the White Temple. In full juxtaposition to the White Temple is Rong Suea Ten, aka the Blue Temple, a few miles away. Completed only in January 2016, the temple is mostly blue and gold, and with a Lanna motif – one of the native tribes of northern Thailand. The name of the temple means dancing tiger, in homage to the plethora of tigers that used to roam the jungles of the region. Sadly, there are no longer any free tigers in Thailand. The Blue Temple is certainly beautiful. It turns out the designer and artist was a student of Mr. Kositpipat. Just from the pictures here, which temple do you like better? Always open; no entrance fee. If you’ve ever been to Hearst Castle in California, you’ll know what this place is like. For decades, artist and collector Thawan Duchanee built and decorated his house until he passed away from liver failure in 2014. Some of his paintings have sold for nearly 1 million dollars, and his work has been featured all over the world. The Black House is actually a collection of structures housing his works and collections. When I went, very few of them were open, but you could still see inside the windows at all the collections and artifacts inside. The main hall is something out of a fantasy movie, with giant thrones adorned with horns, and giant snake and crocodile skins laid along the banquet tables. Perhaps the most interesting building is the one shaped like a whale slipper. I just can’t think of what else to call it, but that’s where Mr. Duchanee used to sleep. Read my full article on the Black House Museum. This attraction was an optional part of the tour, and all of us opted not to go. There is a lot of controversy about visiting the village. Karens are one of the tribes in Myanmar. Due to problems in their country, they sought refuge in Thailand, but don’t have official recognition as citizens here. Because of their unique characteristics, including their weaving skills and the brass rings they wear on their necks, their village has become a tourist destination. But it is unclear if the money goes directly to them, or to the Thais who have organized their village. Always open. Entrance fee: 300 baht ($9). The story behind the tea plantations in northern Thailand is rather interesting. In the 1950’s, a group of Chinese was chased out of China. They relocated to Northern Thailand, and used the ideal climate and conditions to cultivate oolong tea plants. Numerous plantations are located all over Chiang Rai, many of which include visitor centers and tastings. I was able to see the art of how to make and drink the tea. Believe me, it is an art, and the result is absolutely incredible. No milk or sugar needed. The list of benefits the tea gives makes it sound like a wonder tonic, and I’m certainly willing to agree. This is purely a tourist attraction, and the monkeys know it. Basically, every day a troop of monkeys comes down from a cave in the hill to get food that tourists throw at them. Usually it’s just bananas and peanuts, but I saw some other things thrown at the monkeys too. They will also rummage through trash, grab things out of your hands or even go through cars and scooters to grab whatever piques their interest. Oddly, my tour guide didn’t actually direct us to the fish cave, but the reviews of it aren’t the greatest. Just a bunch of tourists looking at fish in a pond. Opening hours: Everyday 8:00-18:00. Entrance fee: 100 baht ($3). Mae Sai is a huge town, spanning both sides of the Ruak River which separates Thailand and Myanmar. It is one of only three border crossings between the countries, and the only one in northern Thailand. There’s not much to do here, unless you plan to cross the border, but the temple overlooking the Friendship Bridge is rather interesting. It’s called Wat Phra That Doi Wao. First of all, you can only access it by driving up a one-way street in the middle of a market. Second, the temple is also called the Scorpion Temple, and a giant statue of one overlooks the valley. The Golden Triangle is the location on the Mekong River where Myanmar, Thailand and Laos all come together. Perhaps not the most exciting place on the tour, but I personally enjoyed it. Our guide also told us about how the Chinese have been using the river for centuries for exports to SE Asia. After all, the Mekong has its source all the way in the Himalayas! In 2005, a Chinese businessman leased the land along the Mekong from Laos in order to build casinos, some of which you can see from the hill at the Golden Triangle. Grab your selfie, and then head to the bottom of the hill where you’ll find a rather interesting attraction. It’s about a 2-minute walk from the hill overlooking the Golden Triangle to the House of Opium. This unique museum is quite small, yet offers a very interesting look into the opium history of not just northern Thailand, but most of SE Asia. After all, the opium trade has influenced the region for centuries. The museum also goes into the different tribes of northern Thailand, including the Karens, as well as the giant Mekong catfish. So much information in such a small building. Opening hours unknown. Entrance fee: 60 baht ($2). This location is not currently on Google Maps and has no website, but you can find it on the map below. The final stop on the tour was another temple overlooking the Mekong River, several miles south of the Golden Triangle. The name of the temple means “shading rock,” and it houses ancient relics of the Buddhist religion. It doesn’t compare to the white or blue temples, but the landscape around the temple is certainly beautiful. You can always skip this one if you’re running short on time. Opening hours: Everyday 6:00-18:00. Entrance fee: free. Click on the star next to the map name to save it into your Google Maps for easy reference if you plan to drive to the locations yourself, or just want a reference where you are while you’re on the tour. 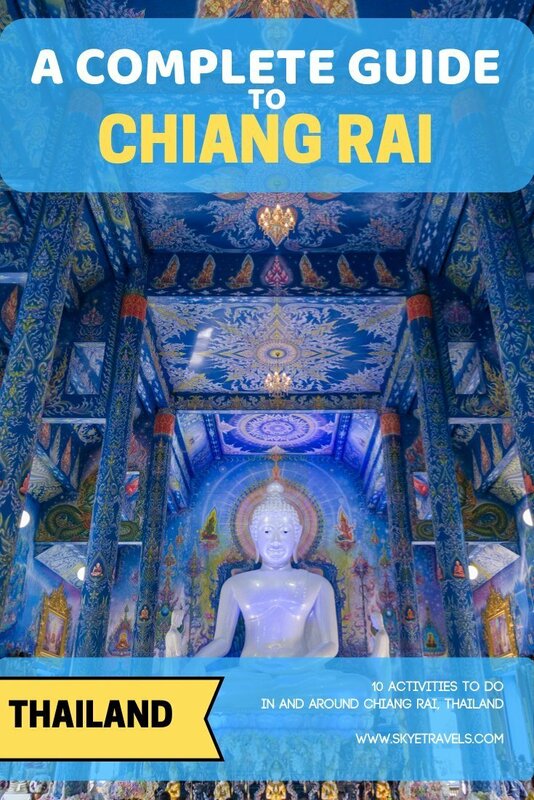 If you’re looking for more attractions in Chiang Rai or perhaps want to visit Pai (a village near Chiang Rai up in the mountains), here are some more stories.. Finally here’s some extra reading to save hundreds on your next vacation or stage of your journey. OMG, thank you so much! Chiang Rai couldn’t be a better place for you to visit! Your TempleSeeker website is going to be overwhelmed! DO you have a way to contact that tour?